This topic describes service mesh for Cloud Foundry. Cloud Foundry includes an optional, beta routing plane that uses a service mesh. A service mesh provides traffic management, security, and observability for microservices. For more information, see What is a service mesh? in the Istio documentation. It does not have feature parity with the existing routing plane in Cloud Foundry. The following table describes each component VM deployed as part of service mesh in Cloud Foundry, along with their function. 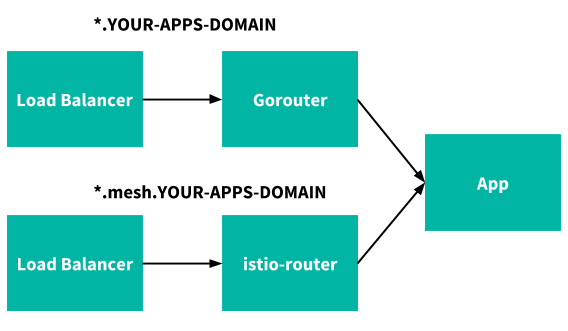 istio-control copilot, pilot-discovery Propagates Cloud Foundry external routes to all service mesh routers.